Crémant de Loire is any wine made in the Loire Valley by traditional Champagne methods, and since I am in the Loire Valley now visiting friends and I can easily try several, it makes sense that this will be our first article on non Champagne, even though occasionally Crémant de Loire is incorrectly called Loire Champagne. The Loire is the largest producer of sparkling wines in France after Champagne and these are inexpensive, lovely, and easy drinking wines, often amazing under US$20 bargains. The term Crémant de Loire was officially recognized as an AOC, Appellation d’origine contrôlée or official wine region, in France in 1975. Crémant de Loire is made in Anjou, Touraine, and Saumur, the heart of the Loire Valley, and both Blanc and Rose versions are popular. A wide variety of grapes are allowable. White grapes allowed are Chardonnay, Chenin Blanc, and Arbois, and black grapes allowed are Cabernet Franc, Pinot Noir, Cabernet Sauvignon, Grolleau, and Pineau d'Aunis. These are a wide variety and quite honestly I'm not familiar with all of these and you probably aren't either. Most commonly these wines are made in and around Saumur and are a blend of Chenin Blanc, Chardonnay, and Cabernet Franc, with an emphasis on and majority of Chenin Blanc in most blends. Notice that Sauvignon Blanc, the star of many Loire wines, is not allowed! Despite having high acidity, Loire Sauvignon Blanc is not considered suited to sparkling wine, although some other sparkling wines in France do use it, such as Crémant de Bordeaux. There are other Sparkling wines in France made by the traditional Methode Champenoise which include Crémant d'Alsace, Crémant de Bordeaux, Crémant de Bourgogne, Crémant de Die, Crémant du Jura, Crémant de Limoux, Crémant de Loire, and also the nearby Crémant de Luxembourg from Luxembourg of course. Here is a tasting note for a Crémant de Loire - it had been sitting in the fridge for a couple of days in St Benoit sur Loire and bought locally. 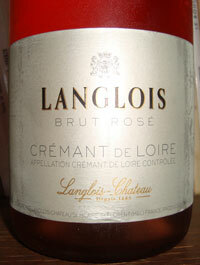 Tasting Note: Langlois-Chateau, Langlois Brut Rose, Crémant de Loire - September 2011, rated B- and I like it. A lightish "Pink Grapefruit" color. On the nose, strawberries, fresh warm white (French?) bread, roses. On the palate, light red fruits, some orange flavor without the citrus acidity. Pleasant. Light and joyful. In quality and overall impression, this is like a good Southern France Rose. The best aspect to me is the warm bread component on the nose. 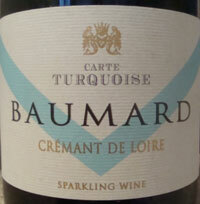 I am an enormous Baumard fan and some of their wines are simply world class wines, e.g. Quarts de Charme and Coteaux du Layon Clos de Saint Catherine . Their Carte Turquoise Crémant de Loire however did not show very well. It's a blend of about 60% Cabernet Franc and 40% Chenin Blanc with a small dollop of Pinot Noir mixed in. The nose was nice with delicate lime/lemon/orange and pear. The palate was syrupy and awkward but had pleasant pear and orange.